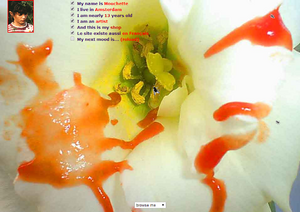 Mouchette.org is an intuitive site made in 1996 by a virtual individual, a pseudonymous character, an Amsterdam based craftsman who calls herself Mouchette. With her blameless welcome and claims to be "nearly thirteen" welcome us from the introduction page, what at first shows up as an individual site of a pre-pubescent female artist, develops into darker subjects in the subsequent pages. All through Mouchette.org, death is one of the main themes concentrated on. The subject is happened using the fly on practically every page on the site. One page even plays a tune out of sight, while the screen peruses "Lullaby for a dead fly." The theme is developed by particularly concentrating on suicide and violence. One page even asks what you think the most ideal approach to kill yourself when you're under 13 is.